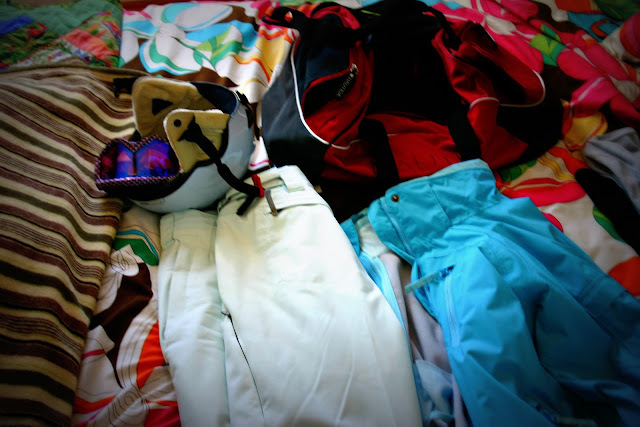 I'm sitting here on my bed wearing my snowboarding pants in an attempt to come to terms with them. I have this theory that if I wear them enough around the house, I will become accustomed to the constant restriction of movement. My boyfriend and I are going to mammoth for some snowboarding this weekend. Our mutual friends moved up there last year and we are going to crash their living room for a joyous four days and three nights. I was sooo excited until about 30 minutes ago when I started pulling out all the warm clothes that I'm going to have to wear. HOW DO YA'LL DO IT?? The long underwear is giving me the heebyjeebies, and when I put anything over them I can't help but waddle! The maximum clothing I'm used to wearing is maybe..maybe a jacket over a sweater. Maybe some heavier socks with your uggs. A beanie? Its for style points, because we have no need to keep our ears warm around these parts. Sorry. I'm being a baby. We are going to have a great time making memories. I just have one concern about dressing like a marshmallow..
How in the world am I going to get over the constant claustrophobia?! I guess I'll have to figure that out. That said, I'm going to go try to P90X my anxiety away before I resume packing.